That’s somewhere around 85% complete. I’m hoping to have it done in the next couple of days, because I’m itching to start my next project. I got a PM on the Knittyboards with a question and a link to a pattern. (For you non-Ravelers, the pattern is for a pair of stranded mittens with dragonflies up the back of them) I’ve got some solid Cherry Tree Hill sock yarn that I think I’ll use, as soon as I determine what color combo I want to go with. Saturday night, Kris and I met Carrie, Alex, his brother Eric, and his friend Tim at our favorite sushi place for dinner, after which the boys went off to shoot at each other (AirSoft is now a bi-monthly thing), and Carrie came back here for a girls’ night. We watched movies (Benny and Joon, Grease, The Road to El Dorado, and The Muppet Movie), spun, and knit. I broke out Zaphod for the first time in ages, and I filled an entire bobbin with most of the second braid of some merino I bought last year at… um… I think Maryland Sheep and Wool. I’m 99% sure that it was there – it’s from Cloverleaf Farms, and the color is Rose Quartz. 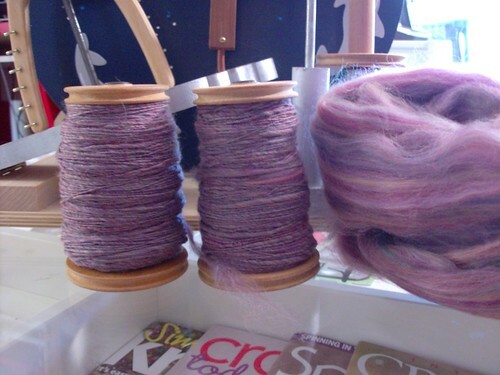 I’ve got another bobbin that I filled last year (I started it at SAFF ’07, if I remember right), and I’ve got a little bit of the roving left. I’m trying to decide if I want to ply it or what. If I do, I think I’ll run the first bobbin back through to even out the twist a little, AND to revive it, since it’s been on that bobbin for a year now. I might leave it as a single, though – it’s pretty the way it is, and I’d (obviously) have more yardage that way. Also, Carrie told me something interesting Friday night (actually, a couple of something interestings, but only one of which applies here) – Dave at the Merlin Tree has developed a conversion kit to make a Hitchhiker into a double-treadle wheel. I’m going to have to investigate this, because I definitely find Elphaba easier to use now that she’s a double. I’m betting Zaphod would be the same way. 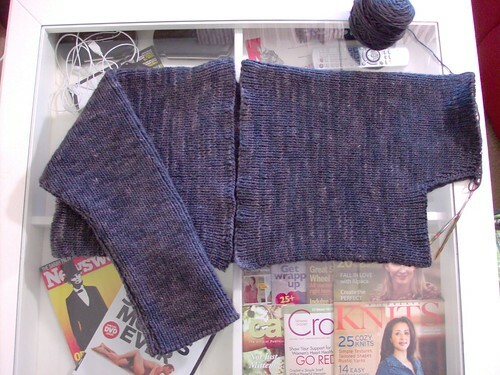 November 24th, 2008 | Tags: Knitting, NaKniSweMo08, Spinning, WIPs | Category: Misc. I have absolutely no idea what you’re talking about with the spinning, but I really like just saying the word “Elphaba”. And the purpley yarn sure was purty. Spin-ins need to happen more often. Especially now that you’ve gotten drawn back in muahahahaha…. A double treadle?? Uh oh,, looks like I’m sending Dave another email to investigate this too! Lovely! I think it’s a riot that you watched Benny and Joon! 2 FO’s for November? Overacheiver! PS…What IS that DVD peeking out from under Carmelo? Looks intriguing. Yay spinning! I think I might play with Al a little bit tonight. I’m in the mood. I can’t believe you’re almost done with a SECOND sweater!